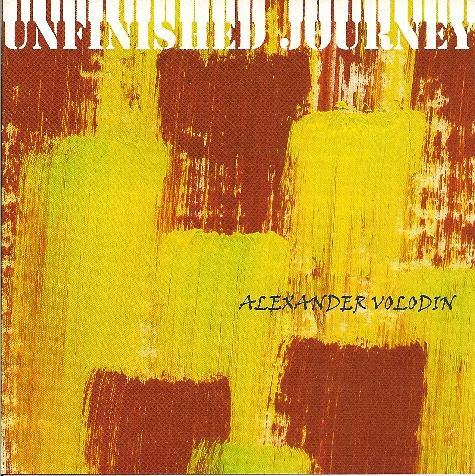 Alexander Volodin - "Unfinished Journey"
Unfinished Journey is Russian composer and musician Alexander Volodin's second release for the Electroshock label. Volodin plays all instruments on the album, with guests on saxophone, prepared guitar, violin and voice. Different Things is a 20 minute piece in 3 parts. The first part begins with light clatter, scratching, and sounds from nature, both electronic and samples that sound real. Volodin uses scratching, breathing and machine like howls and drones to interesting effect, making for an audio art collage experience that can be alternately subtle and intense. The second part is an intriguing blend of percussion, acoustic guitar and sound effects. The drums came crashing in unexpectedly a couple times, which was quite jolting given that I was focusing on the subtleties of the sound creation that was going on. I liked how the guitar would play intermittent melodies while the rest of the piece was more purely sound focused, and it all fit together in an odd but pleasurable way. The third part is my favorite, being a saxophone led avant-noise/free jazz piece. The sax jams and wails, accompanied by various sound ephemera. Silver Threat is a busy and sometimes noisy glom of voice, violin, prepared guitar and other sounds. It's a combination of experimental chamber music and noise-art, and my favorite moments are when the violin is playing intense screeching melodies while the voice growls and moans and the guitar fills an off-kilter rhythmic function. These guys actually get rocking at times and when they do its strangely industrial, orchestral and even punky. VERY cool! There, House Stood is the 41 minute epic of the set and is quite a journey. It starts off as an ambient soundscape piece where mood and atmosphere are the focus. It's a nice blend of space excursion with sound samples thrown in - birds chirping, an airplane, flies buzzing. Of course with a piece of this length there are numerous transitions and Volodin handles the progressions with a skill that held my interest throughout, moving through all manner of sound-art mood segments, with sound and atmospherics variously leading the way and interacting with each other, both in cooperation and dialectical contrast. It even gets moodily musical at times, while at others we are voyeurs during interactions between people talking (or solitary sleeping), accompanied by music and sounds. This is quite an engaging set of audio art and music and I have to give Volodin credit for a free-wheeling flow of ideas that all come together in a way that made for an enjoyably immersive listening experience.